Couldn't have asked for a better weekend! It started snowing just before we went out and had my best friend with me. 300 mag / was going to use my bow but I wanted to give this animal the respect of making it a quick death. Hunted it spot & stalk. High fence (Yes) I would do it again too. Last edited by Stub; 02/11/19 08:24 PM. What outfitter did you go through? Congrats!! That’s a bunch of meat! 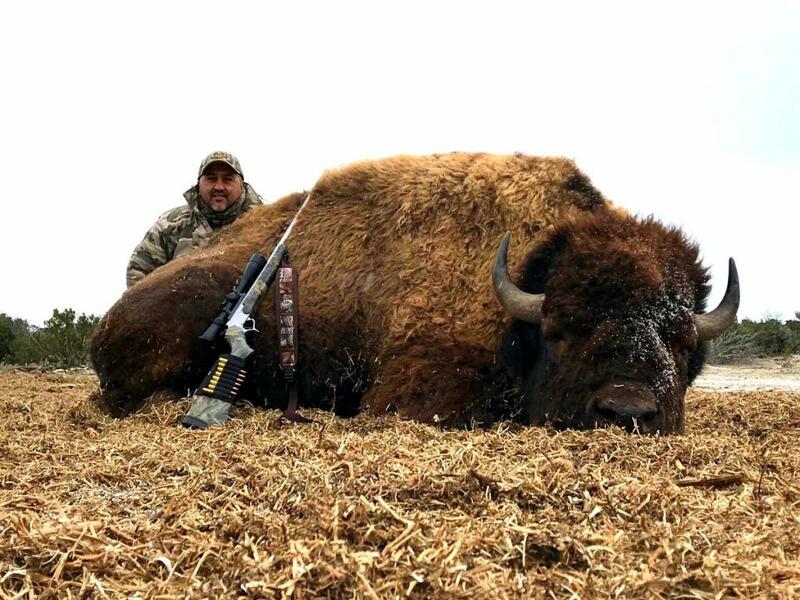 What a beautiful bull, well done! Congratulation, will be a bunch of great eating. Great job on picture. Dudes a boss, make sure you keep the hide, my wife killed a young bull and we euro the head and had the hide made in to a rug and its by far the nicest hide we have. "Things may come to those who wait, but only those things left by those who hustle." The winch was rated at 2500 and it couldn't get him all the way off the ground. We had to use the bobcat. Getting a shoulder mount and a euro done and the hide as well. That is really cool. I would love to shoot one. That one is a beast. Congrats. That's HUGE!!! A bucket list hunt for me. I bet it's delicious!! Buffalo Mountain outside of Abilene???? By grace alone; through faith alone; in Christ alone!